Most people would go out and purchase a replica of Kate’s engagement ring (Diana’s ring originally), but me, I want to make it myself. Not even Kate or Diana could say that they made it themselves, but the real ring is probably more stunning than my crystal beaded version. So this is a free pattern I found on “Bead & Button” website (instruction link at bottom of post) and excitement set in. This is probably a go to pattern if you want to make a crystal ring. I have made this ring twice a round version first then the oval version. The oval because I haven’t been able to easily find the round 18 mm Montana blue rivoli again. So if I make this up as a gift later, I wanted a practice one to see how hard the oval version is. The crystals required for this project is the hardest part to find. 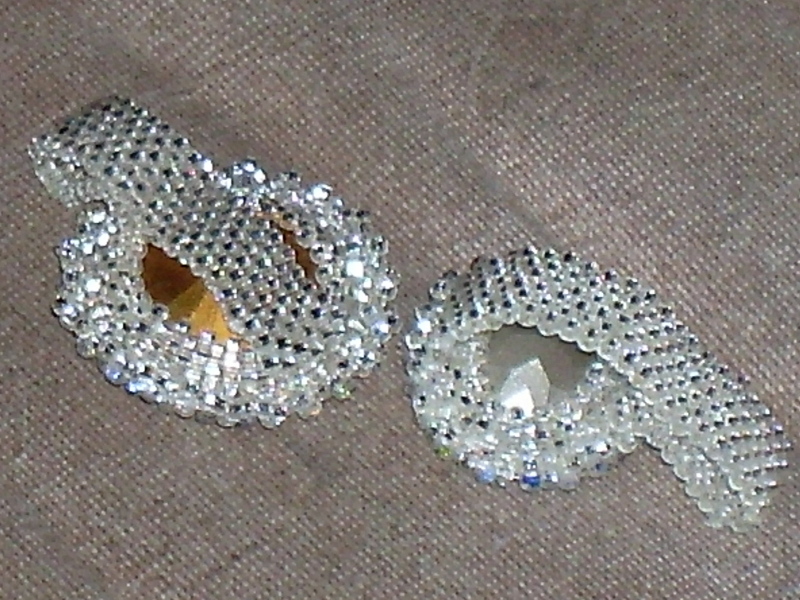 The little 2 mm round crystals were purchased on-line. I was extremely fortunate on the circle Montana blue crystal to find the 18 mm rivoli at an actual store. The oval Montana crystal was purchased on-line at a different place. I substituted plain seeds in for the charlottes. The size 15 beads are so small that it doesn’t show easily that a different bead was used. I made the round version last year, so I don’t remember all those construction details. I remember being impressed with it even when I wasn’t finished (it had been the most complicated looking item I had made to that point) and that I was a little apprehensive about not having pictures in the instructions to follow along. 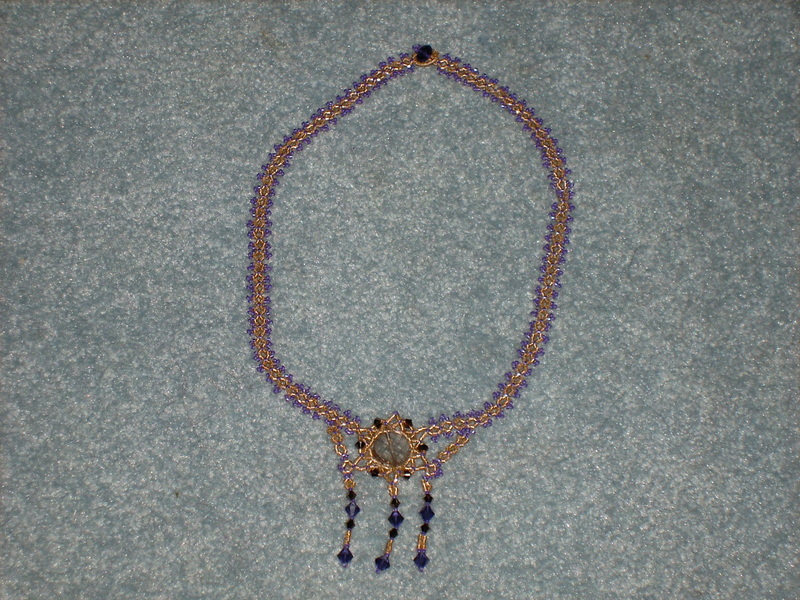 The oval shape took just over an hour to bead, set the crystal, and embellish. Then probably another 20 minutes for the ring band. So after completing it once, it does get alot easier to make again even in a different shape. 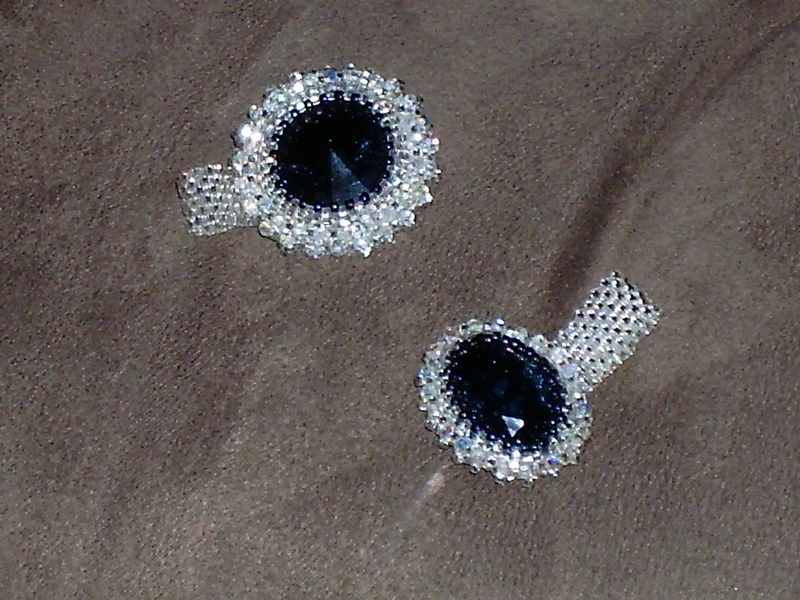 Here is the link to the instructions: http://cs.jewelrymakingmagazines.com/BAJCS/blogs/beadandbutton/archive/2011/04/18/royal-engagement-ring-tribute.aspx . I brought the book “Beaded Allure” by Kelly Wiese at a local craft store last fall. After flipping through, I was a little worried about it; it seemed there were very few single star difficulty projects. I originally learned seed bead weaving back in 1998 when I took a class at a local bead store. The class project was a beaded amulet bag using the even count tubular peyote stitch. So I more comfortable taking on harder challenging projects with even count peyote stitches than with other different stitch types. 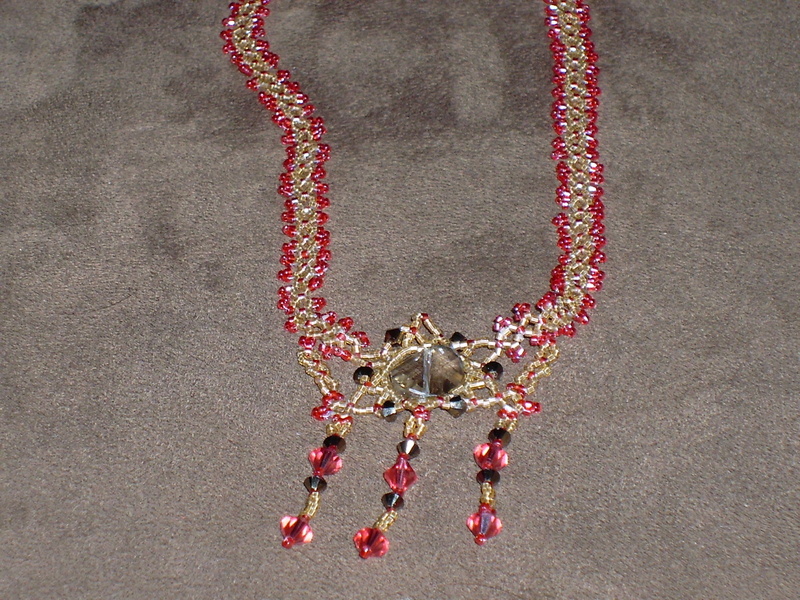 Crystal & Picot Necklace from "Beaded Allure"
I have actually made the “Crystal and Picot Necklace” pattern twice. The first one is the pink and light copper. The second one is the purple and light copper which my mom asked me to make for my aunt. The instructions for the pattern are very well written and have pictures of each step. It is easy to compare what you did with what you were suppose to do. The hardest part I encountered was the first couple rounds on the focal center bead. But I think that was because I used a 14mm bead instead of the 12mm bead recommended by the pattern. It just took a little time and patience to get the 2nd round on my 14mm bead to look similar to the 2nd round on the 12mm bead in the pattern. The chain in the pattern is just a bunch of looping circles and looks delicate. But it isn’t as delicate as it looks. On both necklaces, I had to remove parts of the chain so I could redo the clasp. I couldn’t just pull on any section and get two of the “links” apart. I had to remove each link separately. I used about 17 to 20 cylinder beads for the loop on the clasp to get it around my 8mm rondelle crystal and 3 cylinder picot. The chain design would be fairly versatile. I can easily picture using it on a beaded glass ornament connecting beaded raviolis. I know that the winner of the Pattern Review Vintage Contest is decided by votes on entries, so multiple entries don’t help you win. However, there are so many wonderful seamstresses over there that I think is it pretty safe to say that any additional entries I put in won’t make too much difference. I joined the contest mostly for the fun of sewing and that vintage patterns are good opportunities to practice sizing patterns to fit. So it is valuable skill building. This is another cute pattern from the 1960’s era. 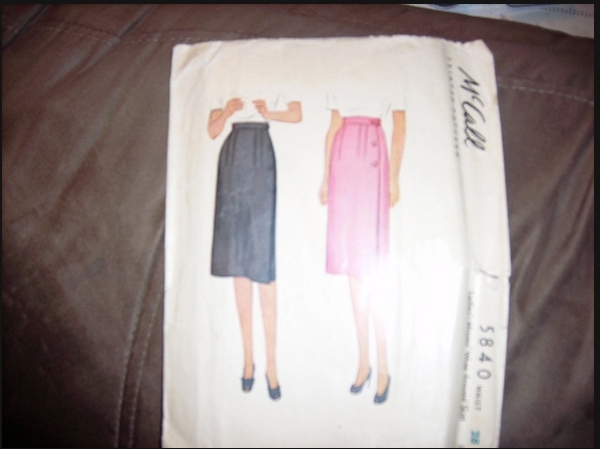 It is Simplicity 5267 (from 1963) and is a simple straight sheath dress with a detachable collar and tie belt. I made view number 3, the sleeveless dress with just a belt. But I didn’t make the tie belt because I think I would prefer a buckle style belt instead of a tie. I may do the detachable collar later just for a little variety with the dress (the collar would probably look really cute with a cardigan). This was another one of the patterns I found at an antique mall. Like the wrap-around skirt, this pattern wasn’t the correct size. So I added an additional 4 inches so that the dress would fit. Because of the additional inches added in width, I had to reshape the neckline and the armsythe (narrow the shoulders). I shortened the end of the dress 6 inches and used a 3 inch hem. I used my serger to finish the inside seams. I like the facings and think I will probably go back and tack the facings on the inside so they don’t flip out. Sewing background- I would be classified as an advance beginner sewer. I am at the point where a good portion of the items I make turn out fairly decent. Seams are fairly straight, and finishing seams is getting much better. I am still terrified to try to make a buttonhole though. So my first entry in the Pattern Review Vintage Contest is a wrap- around skirt from Simplicity 5385. The pattern is dated 1964. I found it at an antique mall. It is a 4 piece pattern so it is fairly simple with not a lot of pieces. Just a pocket, pocket facing, tie and skirt. Only one main seam to sew. So my main challenge with it was to size the pattern up so that it would fit me. The pattern was a vintage size 16. The waist needed an extra 4 inches. So I added an inch at the center seam and an inch to each edge of the skirt piece. I didn’t move the darts at all. The other alternation I made was to shorten the pattern a couple inches so the skirt was knee length. The side challenge is to make sure I get a skirt that is still current looking and usable for everyday while using an older pattern. 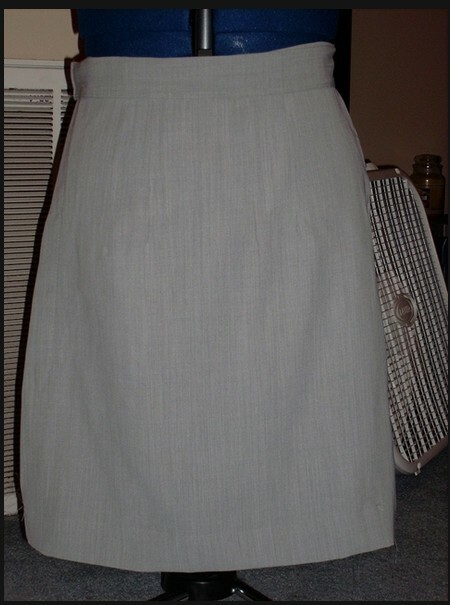 This was easy because I chose to make the skirt up in a sandy tan color linen look blend of rayon and poly. The instructions are in unit construction format and are very good. They break the whole down to reasonable parts and there was a lot more detail than I expected. A previous 1960’s pattern I used before had 3 instructions for a pair of pants and pretty much assume the sewer knew about construction of garments. I used a French seam for the center front seam for a clean look on the inside. The pocket facing easier than expected and so it didn’t flip out of the pocket, I went ahead and edge stitched it down. 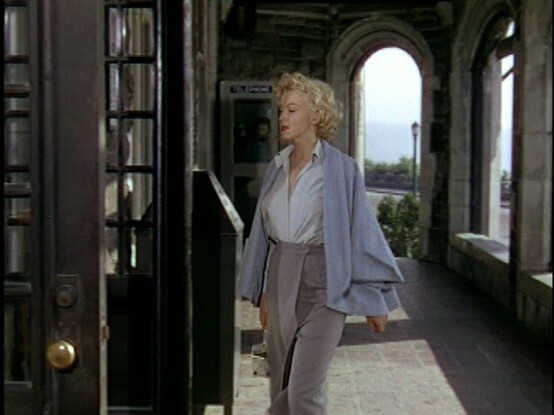 The skirt is fastened by a couple of snaps in the back. Instead of just sewing a small square to the back of the outer layer to hide the closures, I lengthened the square into a facing across the entire waist of the skirt, a minor detail change. It looks nicer because the stitches go across the entire width instead of just stitched squares ( a little out of place).